Are you hesitant to take public transportation or a car pool because you worry about being stranded at work if there’s an emergency at home or you have to work late unexpectedly? We have just the program for you! Sign up for the Emergency Ride Home (ERH) program, sponsored by MIT and run by the Charles River Transportation Management Association (TMA). The ERH program provides eligible employees, who forego commuting alone in a car, with cab or rideshare service home in case of personal or family emergencies. Any MIT employee who uses public transportation, carpools, vanpools, bikes, or walks to work at least three days per week may use the program. Participants in the ERH Program may obtain a ride one time per month up to four times per year. Simply register in advance, hail a ride in the event of an emergency, and submit your receipt within 5 days, and receive your reimbursement in 10-15 days. Here’s how it works. You must register with Charles River TMA prior to using the program. Once Charles River TMA has received and processed the completed registration forms, an orientation package will be sent to you with program information. Please note that registration may take up to three weeks. In the case of a personal emergency or unexpected overtime, simply use any ridesharing app, such as Uber or Lyft, or cab company to get home. Once you have taken a trip, email your receipt* to Charles River TMA and submit a confirmation report within 5 business days. You’ll receive reimbursement within 10-15 business days. You may include a tip for good service but it may not exceed 20% of the fare. * For ridesharing service receipts – simply take a screenshot of the in-app receipt on your smart phone or request a receipt after the trip. 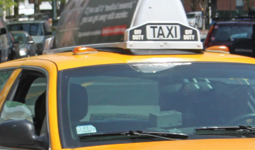 * For cab ride receipts – request and fill out a voucher and give it to the cab driver to complete. Take the receipt portion of the voucher and scan it or pop a photo of it with your phone.